But forget all the puerile huffing and puffing emanating from the United States-North Korea brinksmanship. Why? Because there will be no nuclear launch or missile launch or other military attack. Why? Because to do so would be sheer lunancy. North Korea is more rational than you think: The assumption that the country is run by a lunatic is not only incorrect — it’s dangerous. The rationale political figures on the US side are aware of this as well. Donald Trump sounds lunatic, but he can’t be considered suicidal in the conventional meaning of the word, as he’ll not be in the line of fire. However, to start a nuclear conflagration that leads to massive deaths of not only North Koreans but South Koreans, Japanese, and American military personnel in the region would be suicidal for Trump’s business interests. The devastation and fall-out among allies would render the Trump brand radioactive. So no, there will not be a military response from either side. The American side could not emerge from initiating such a asymmetric attack with any pretense of international prestige or high standing intact. 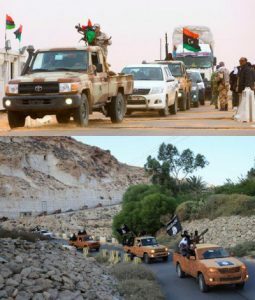 Images: Libya’s so-called freedom-fighting “moderates” literally just repainted their trucks after NATO’s 2011 intervention, becoming ISIS’ Libyan branch. The US now finds itself justifying yet another military intervention in Libya to fight the very terrorists it helped arm and put into power in 2011. Will North Korea dismantle its nukes? Its nukes are meant as a deterrence (albeit there may well be some secondary basking in the technological achievement of having attained nuclear-power status). Without nukes, North Korea would depend on the integrity and good will of the US, which the Libyans and Iraqis now know well not to depend on. If the playground bully carries a baseball bat to threaten other children, can one blame the other children if they start carrying a bat with them? The bully knows if he swings his bat at anyone that he’ll be ducking bats swung in retaliation. Unless one is a sado-masochist, it is not so enjoyable bruising others when one gets bruised as well. By analogy, North Korea is well aware of the effectiveness of nuclear deterrence. The record is clear, no nuclear power has ever dared attack another nuclear power. There has been all kinds of braggadocio but never a military confrontation. Consider the current situation in the Doklam Plateau where there has been a standoff for 50-plus days between two populous nuclear powers, India and China. Neither side has yet resorted to violence. North Korea has never attacked the US. It is only the US, when it intervened in a Korean civil war, that engaged in battle against North Korea. So what moral authority has the US to threaten North Korea? After all, when discussing military threats it is the US holding hostile military maneuvres in Korean waters (not North Korea holding military maneuvres in US waters). The US lack of diplomacy — all stick and little or no carrot — has demonstrated to be a failure in achieving denuclearization. 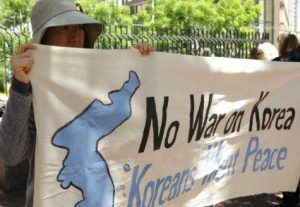 At a minimum, North Korea wants a peace treaty, an end to the US troop presence in South Korea (which many South Koreans want as well), and an end to sanctions against it. These measures might spur North Korea to end its nuclear program. It would be a quid pro quo demand. But North Korea is leary of US assurances. After all, did the US adhere to the Agreed Framework with North Korea? And what would stop the US from orchestrating a false flag to attack a denuclearized North Korea? The examples are myriad, including the phantom missile attack in the Gulf of Tonkin, the vanishing Iraqi WMDs, the apocryphal slander of Libyan troops being supplied with Viagra to carry out a spree of rapes, and the disinformation of Syrian government forces having used chemical weapons. Despite hard right-wing reservations in the US, such a quid pro quo would cost the US next-to-nothing, and it would be hailed worldwide for its diplomacy. Trump has called for decreasing the number of US bases overseas, so this would be a major triumph for him: the first US president to officially end the Korean War as well as bring about the peninsula’s denuclearization. Considering Brack Obama was awarded a Nobel Peace prize for absolutely nothing, bringing peace to the Korean peninsula would assuredly earn Trump, in spite of his bombastic rhetoric, his own Nobel Peace Prize. Above all, if all sides honored such an agreement, it would be a victory for the rest of the world. This article was posted on Monday, August 14th, 2017 at 3:00pm and is filed under Donald Trump, Imperialism, Korea, Militarism, Nukes, War Crimes.